As far back as 2010, consumers have acknowledged that online shopping can make present buying far less stressful than shopping inside an actual store. Consequently, the festive season - a time when most city centres are overflowing with angry gift shoppers and the latest Zoella book is selling out left, right and centre - is the ecommerce world’s time to shine. There is, however, just one caveat: how do all you ecommerce marketers know when a customer is purchasing an item as a gift? And how should you incorporate that customer into your marketing strategy once the festive period is over? We will also reveal how you can go about creating a brand new customer out of the gift buying process via a spot of good old-fashioned marketing collateral. Knowing whether someone is shopping for themselves or as a gift for someone else is useful to know, and can help make your communication with them (and maybe even the recipient of the gift) more relevant. Nonetheless, figuring out whether a purchase was a gift or not is a tricky business, especially if you have a customer that shops with you for both themselves and other people. The future undoubtedly lies in predictive analytics that can detect when a customer makes a purchase that falls outside of their personal 'taste profile', with no manual work needed. However, in reality, this may be quite far off for even the most data-savvy retailers, so here are a few actionable ways you can identify gift shoppers when they come your way this Christmas. Some retailers include a tick box at the checkout, asking a customer whether or not their purchase is a gift. Here’s an example from Selfridges. Another way to determine whether or not a customer is a gift shopper is to give them the opportunity to include a message inside the delivery, and ask whether or not they’d like their purchase to be gift-wrapped. This is done by the prince of personalised presents, Not on the High Street. 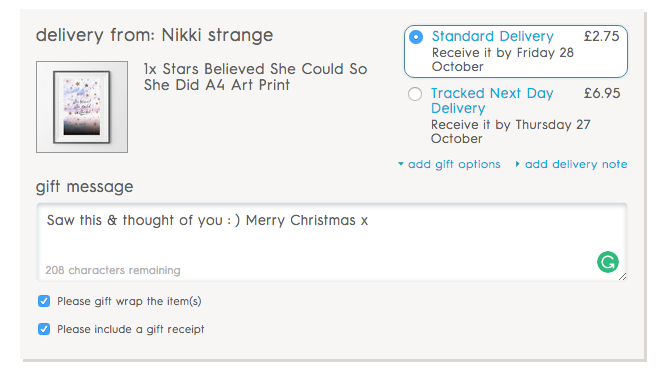 According to Ometria co-founder James, this is probably the most important point to remember as, if you have a customer that wants to buy a gift with you, but write their own message and wrap the present themselves, offering a gift receipt is the perfect solution (as shown in the Not On The High Street example above). 4) Have they shopped in a Christmas gift-specific category? This point is pretty self-explanatory. If a customer shops from a specific gift category on your site, they are highly likely to be a gift-shopper. Some brands choose to use Wishlists and "hinting" campaigns to not only attract giftees, but identifty gift shoppers. This is a slightly more adventurous - but probably more fun - way to identify gift shoppers! 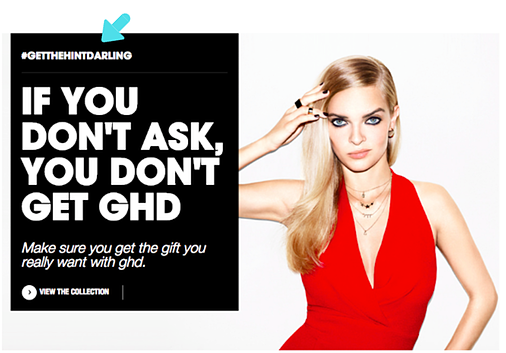 One brand to have used "hinting" to excellent effect is ghd, with its award-winning cross-channel 2014 campaign #getthehintdarling. The campaign enabled the brand's ecommerce team to track when a purchase was made via the campaign, and therefore identify who was a gift shopper. If you don't have the resources to carry out such an intricate campaign, simple wishlisting is also effective. Some brands let you compile a wishlist on your site, so that you can share it with loved ones - basically like a Christmas list. Argos tried this in 2014 with its Christmas wishlist app. A less certain but still effective identifying technique is to look at people who shopped in the Christmas period last year, and who haven't made a purchase since. This increases the likelihood that they are seasonal shoppers, and you can categorise them into a specific segment accordingly. Is the delivery name different to the billing name? Is the delivery address different to the usual delivery address? Is this customer a seasonal shopper - do they only shop at certain times of the year? So, once you've identified people who may fall into your 'gift shopper' segment, it's time to figure out the best way to target them. This is a particularly important point for very occassional shoppers who basically only shop at, let's say, Christmas time, but never inbetween. You may want to consider reducing the frequency that you email seasonal and gift shoppers in the non-Christmas 'down time' (sending them say, one newsletter a month), and then increasing this frequency as the festive season approaches. If you have a customer that made a purchase during the key festive season last year but hasn't shopped since, consider targeting them with an automation campaign that kicks in 11 months after their last purchase, so you're front of mind just before they're due to start their Christmas shopping. Consider targeting gift shoppers with a post-purchase message designed to encourage a speedy followup purchase. For example, you could send a message a few hours after a purchase along the lines of, "Forgotten anything? Get free shipping today! ", containing popular cross-sell items. Why is all of this so important? Because delivering gifts to people in a stylish, timely way is a clever way of not only looking after existing customers, but acquiring new ones. But without permission to market to gift recipients, what options do brands have? If you’re a brand that tends to experience a high percentage of gift-shoppers at Christmas, it could be worth introducing a Christmas gift campaign this year, where all orders in November and December will include a little brochure encouraging people to discover the brand. Alternatively, think about offering vouchers exclusively to orders that you know are definitely gifts. For example, if someone orders something as a gift, the brand will include a voucher in the packaging so that when the recipient opens the gift they will be incentivised to buy again. You could also think about giving the gift recipient a voucher that they in-turn can give to a friend, therefore continuing to spread the word about your brand. The only issue with vouchers is that it could lead to your brand collecting multiple identities, and therefore skewing your data. (In other words, if a customer buys a present on your site and a voucher from the brand is included inside, the subsequent purchase could be attributed to the wrong person). One way round this is to ask the recipient of the gift to sign up to your newsletter in order to receive or activate the voucher (which is also a good way to get a new email address!). If the gift recipient is already signed up, you could offer a unique code to use with an existing email address. Whether you’re a tights manufacturer or a tea provider, with only eight weeks to go until Christmas, gift shoppers should be high on every retailer’s agenda. 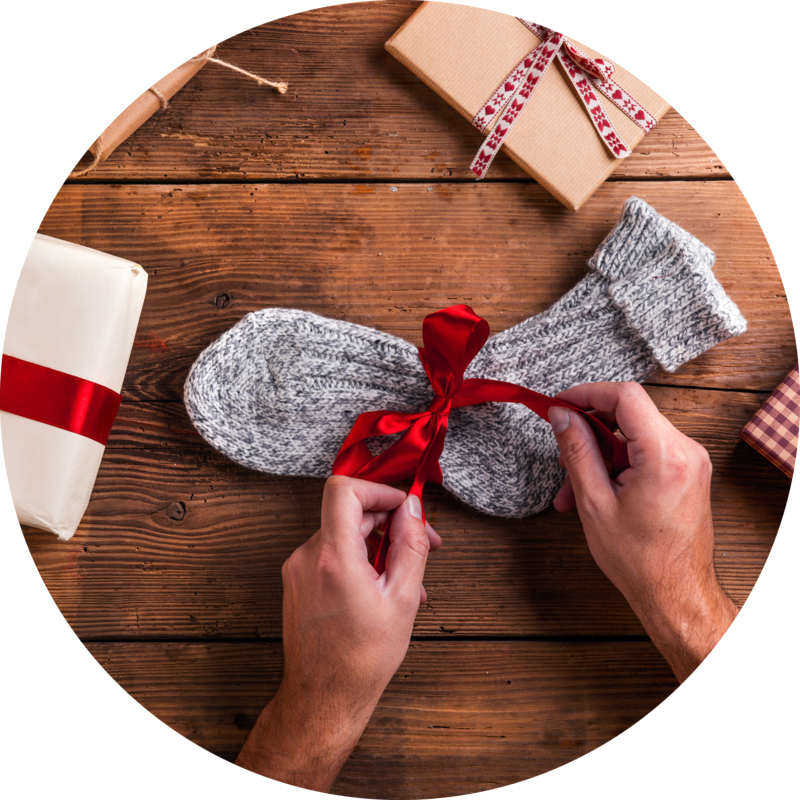 As well as attracting and identifying gift shoppers, make sure they have everything they might need at their fingertips in order to actually make the purchase - after all, buying presents for other people can be pretty daunting. As well as everything discussed in this post, think about including detailed product information, as well as product reviews.